Garages house some expensive items and need as much security as our homes. Therefore, it’s important to have a garage door that will provide strength and durability. Not only this; but a touch of class will transform its look. Garages aren’t simply used to house our cars anymore and often homeowners use them as a gym, a den for children or even as extra storage space for boxes, tools and other household items. And many older designs are damp, with rotting doors and unattractive looks. Particularly if your garage is attached to your home, it’s something you should definitely consider replacing. 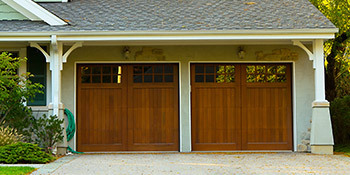 There’s no denying, wooden garage doors look fantastic. They bring a wealth of aesthetic appeal that simply can’t be matched by the traditional steel doors. Wooden doors are most often designed specially to suit the style of the home they’ll be serving. Victorian and Colonial style properties benefit the most from a wooden garage door, but they still bring appeal to every home. There are many styles and designs available too, including the carriage style which tends to be the most popular. Maintenance will be necessary to keep them in their ‘like new’ state, and painting or staining will protect the wood from the elements. If neglected, wooden garage doors can splinter or crack over time, destroying the effect they have on your home. Wooden garage door styles are usually split into three categories; one, two or three layers. The traditional look would be a single layer type. This is by far the most popular and least expensive too. Two layer garage doors offer more in the way of insulation and are a step-up in energy efficiency. This type is most suitable for garages attached to your property and used for parking. Three layered wooden garage doors create a sandwich effect with insulation surrounded by a wooden exterior and interior. As you would expect it’s the most expensive construction type, but is also the most energy efficient. If you’re looking to add an aesthetically pleasing door to your garage, whether it’s detached or attached to your property, wood is a fantastic option for most homeowners. To receive up to four FREE wooden garage door quotes from local, vetted and reputable professionals, simply complete our quick form. The below data illustrates the energy performance of properties in Uk. Energy ratings range from A to G, with A being the most energy efficient and G being the very least efficient. The Energy Performance Certificate (EPC) rating factors heavily when attempting to sell your household, as possible buyers will see what amount they're likely to be paying for their home heating bills. Home upgrades including insulation assist to significantly boost a home's EPC rating. There are numerous types of property in Britain and the info below highlights the type of houses within Uk. Throughout the country the most popular housing types are typically semi-detached and terraced housing, but detached homes, flats and bungalows are also available. The data listed below offers an indication to the number of households in Uk which are central heated and non-central heated. Households are heated by a number of sources which reflect how costly yearly energy bills are going to be. Types of central heating include gas, electricity, oil, solid fuel and LPG boilers. Changing the way in which your home is heated can see you with cheaper bills. The information below displays the spread of properties warmed by various fuels. Throughout the UK the most frequent hands down are gas heated properties, followed by electricity and then oil. Biomass central heating boilers are also growing in popularity, heated by green products like wooden pellets or agricultural waste.|Homes in Britain are heated up by a range of fuels, which include gas, electricity, oil, solid fuel and LPG boilers. Each fuel has a varying cost associated with it which means you can find yourself with cheaper energy bills by altering the way your house is heated. Even solar thermal panels are being regarded as by many in order to cut heating bills for the years to come.